Port Hardy, Vancouver Island where the best Salmon Fishing in the world happens year round. Drive in Vancouver Island fishing at its best. 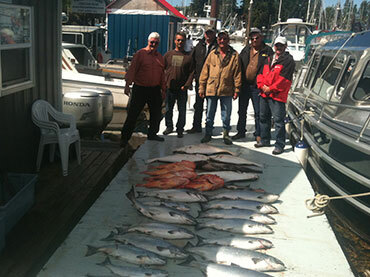 If searching for a salmon fishing vacation, look no further than the experienced guides of Port Hardy’s own Tides and Tales Sport fishing adventures. Located at the top end of Vancouver Island, we are conveniently situated to access salmon stocks migrating down the inside and outside of the Island. What this means to our clients is that they get to fish the areas of highest mixed stock abundance for all five species of pacific salmon. 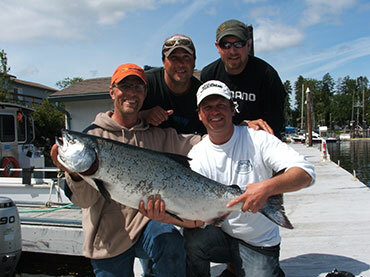 Long known as “King Coho Country”, Port Hardy also has some of the best Chinook or King salmon fishing in British Columbia. This is largely due to both the diversity of habitat, cold upwelling currents, and abundant shoals of baitfish such as herring, needle fish and sand lance. Although this area has year round salmon fishing opportunities, the season peaks from June to September as hungry schools of salmon migrate through and stop to feed on the abundant food sources. 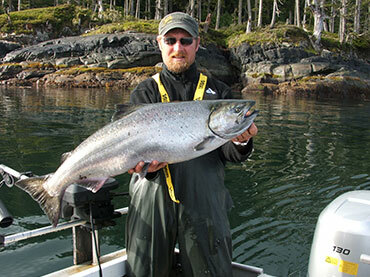 With literally hundreds of spots to try, the Port Hardy area is arguably top of the list for serious salmon anglers. Many of our guests also encounter halibut while trolling for salmon. As Mike Kelly is part of Rapala Canada’s Pro Staff Team, we use only top quality Rapala mooching rods and reels on our salmon fishing charters. If catching salmon is what you would like to do on your next fishing trip to Canada’s west coast, give us a call and book a charter with the “Salmon Professionals”, you won’t be disappointed!